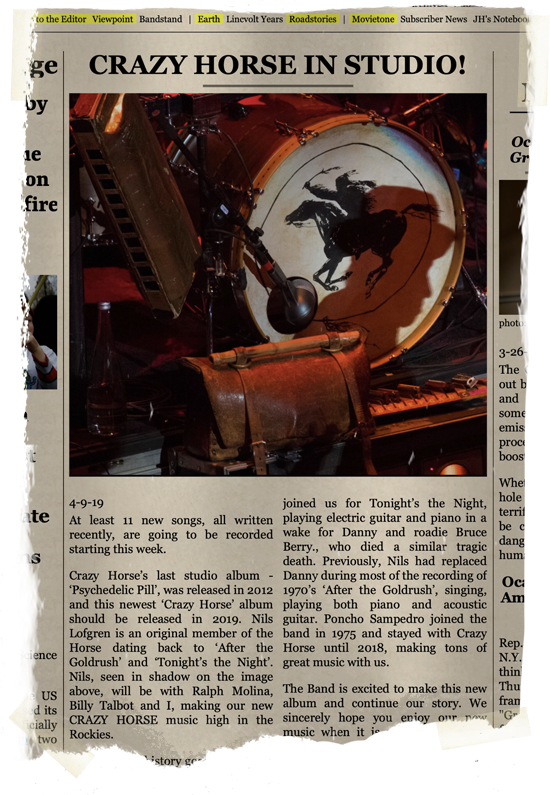 Neil Young News: Neil Young: "Crazy Horse is about to enter the studio with 11 new ones." 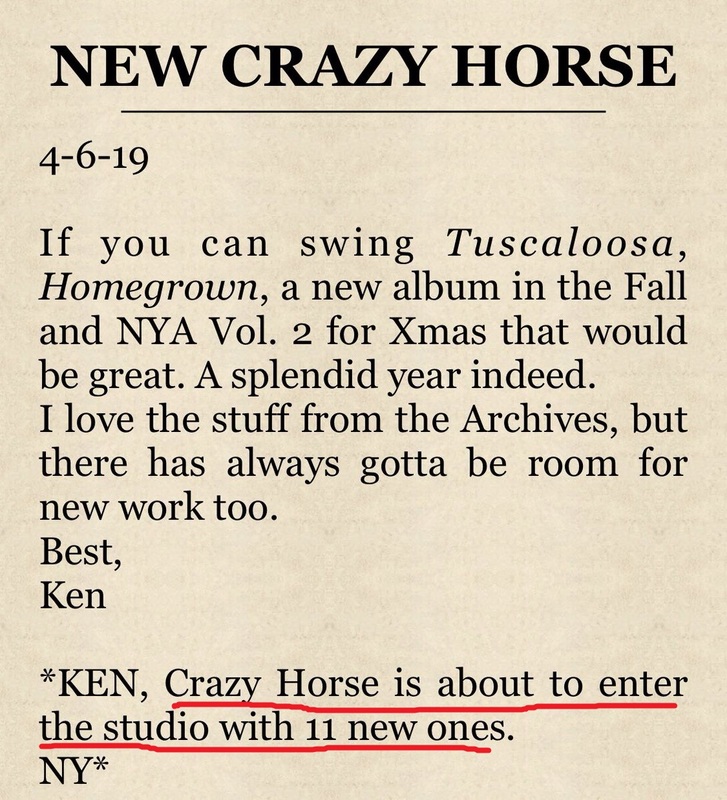 Neil Young: "Crazy Horse is about to enter the studio with 11 new ones." Last month, Neil Young confirmed that more Crazy Horse concerts were to be scheduled, as well as, a new Crazy Horse album was in the works. On today's updated Letters to the Editor section on Neil Young Archives, Neil writes that "Crazy Horse is about to enter the studio with 11 new ones." So it looks like the first new album with Crazy Horse in 7 years since the release of Psychedelic Pill. Nils Lofgren will join the sessions. Neil writes on NYA: "Nils, seen in shadow on the image above, will be with Ralph Molina, Billy Talbot and I, making our new CRAZY HORSE music high in the Rockies." “I’m 70 and I’m retired now and want to stay home. There are many more Letters to the Editor today, so check those out as well. Looks like the NYA Team is really starting to get ready to crank it out in these coming days, weeks, months. We're the lucky ones. Is it wrong of me to feel like, it's not the horse without Pancho? Did Neil ditch him like he ditched Peggi? Where did you read that Pancho is retired? What I read is "kicked to the curb for a hotter model." >As Lofgren returns, guitarist Frank "Poncho" Sampedro — a constant Crazy Horse presence since joining the band in 1975 — will be sitting these shows out. Although the reasons for Sampedro's absence are unclear, Young addressed the change in a newsletter post, saying he was "unable to join us right now" and expressing hope that he'd return at some point. >Whatever the future holds for Sampedro with Crazy Horse, he's made it clear that he's interested in going out on a high note — and his own terms. "I want to do a tour where we know it's the last one and we can really say goodbye to all the people that have always been there for us," he told Rolling Stone in 2014. "I want to share a special moment with them." I believe Ralph Molina posted to Facebook, right after their shows in Winnipeg, said that Poncho was “doing his organic farming thing” in Hawaii. Made it sound like this was Poncho’s choice... and he said THIS was the Horse now. There are several years between those statements you quoted. I’m surprised Ralph’s comment wasn’t picked up elsewhere, but I took a screenshot of his post... it was either on his Facebook wall or on a Neil Young Facebook groups... the day after one of the Winnipeg shows. Poncho interview in the new Uncut magazine: "I'm 70 and I'm retired now and I want to stay home. People say, 'Isn't it sad you're not in Crazy Horse?' I don't think of it that way. I'll always be in Crazy Horse. I'm as big a part of Crazy Horse as anyone that's ever been in it." Finally a reasonable answer. I'm just a little sour on Neil -- the massive disconnect between what he said in his book about his wife and the fact that he ditched her for a younger model. But hey, Pancho is retired, he's retired. Still dig Neil's music, I just made the mistake of believing in him as a person, when in reality, we don't know anyone personally. On a more constructive note: Check out the latest studio still life on NYA. It tells a whole story, and a very long one, that is, about a rhythm section, harmonicas once big and a small arsenal in use, a vintage saddle bag all assembeld around a drum kit with an Indian warrior... This very well could be an album cover for the next Crazy Horse output titled "Nils and Shadows Past". Saved it to my harddrive and wished that Neil/NYA would put out an affordable fine art print portfolio of some of these photographs. Thanks to most all for comments here. Posting updated w/ latest from Neil: "Nils, seen in shadow on the image above, will be with Ralph Molina, Billy Talbot and I, making our new CRAZY HORSE music high in the Rockies." Year of the Horse indeed... I can smell it! Don't spook the horse! New album-Yass! European tour please!